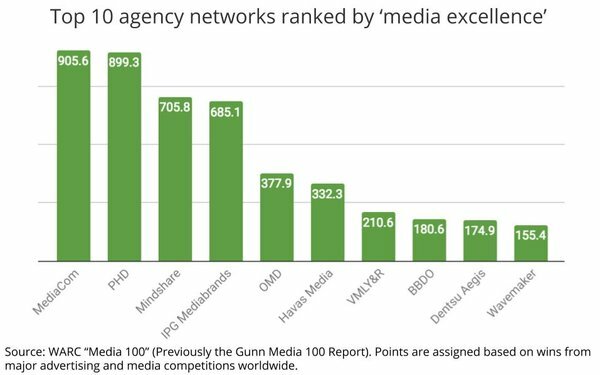 GroupM's MediaCom unit, thanks to a boost from its Tel Aviv office, was the most award-winning agency network in terms of the major media-related advertising competitions worldwide, according to just-released tallies from the WARC "Media 100," previously the Gunn Media 100 report. MediaCom's Tel Aviv office, MediaCom Connections, was the top media award-winning regional agency, according to WARC's top 10 ranking for individual media shops. The Israeli shop had 201.7 points. The only U.S. agency to rank on that list was UM's New York office, which ranked 10th with 104.1 points. The points are assigned based on the number of major competitions each agency, network, client or campaign wins each year. With 905.6 points, MediaCom's global network just edged out Omnicom's PHD network's 899.3 points. 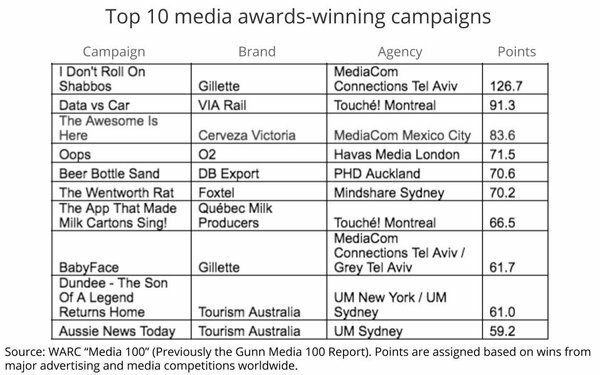 MediaCom Connections in Tel Aviv also scored two of the top 10 campaigns -- Gillette's "I don't roll on Shabbos" (see below) and Gillette's "Baby Face."